This Little Traverse Conservancy nature preserve is almost next door to Lakeside Club. It offers a network of trails (see map) that start at the conservancy’s headquarters, and includes a boardwalk and a viewing platform on Round Lake from which you may see green herons, kingfishers, and an occasional loon. Round Lake itself, although only a stone’s throw from Lake Michigan’s Little Traverse Bay, is at the head of a 40-mile waterway that ends at Lake Huron in Cheboygan. Most of the present 58-acre preserve, which features 2500 feet of frontage on Round Lake, was donated to the Little Traverse Conservancy by the Wrigley Offield Family in 1980. Additional acreage was purchased in 1984-86 by the people of L’Arbre Croche. A walk along the well-marked trails in the Round Lake Nature Preserve takes you through a conifer forest and past a variety of deciduous trees, including sugar maple, eastern hemlock, and bigtooth aspen. Some short boardwalks will help you pass through a damp cedar swamp without getting your feet wet. An old wooden sign marked “Lake View Platform” points to a trail that leads to a longer, recently constructed boardwalk, where you’ll walk past a marshy cove covered with lily pads and surrounded by cattails and other marsh plants, and end up at the platform with its unobstructed view of Round Lake. 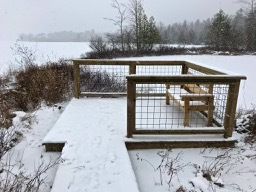 You can access the preserve from the south end of the parking lot at the conservancy’s office, or via a 3 minute walk north from the Lakeside Club entrance on M-119 to a short access trail, which begins behind a utility pole just beyond the Petoskey State Park sign. Please respect the rights of property owners and do not access the preserve by way of private land. Click on the link below to download a trail map that you can save to your desktop and print off. The next time you take a walk in the Round Lake Preserve, consider reporting your observations of wildlife and flora on the preserve’s iNaturalist site. The Conservancy will then have that information on file. And if you’re interested in birding, you might want to take a drive along the Sunset Coast Birding Trail. There’s an overlook and a hiking trail in the conservancy’s Fochtman Preserve on the east side of Round Lake, accessible from Hiawatha Road. This Interpretive Sign at the overlook provides more information about Round Lake and its loons. The following map shows some of the conservancy’s other preserves in the area adjacent to Round Lake.